I looked forward to Microsoft’s May 20th Surface event with great anticipation because I was impressed by the 1st and 2nd generation Surface tablets and I was very curious to see what improvements Microsoft would make to their unique tablet computer. I viewed the gen 1 and gen 2 Surface tablets as very imperfect devices, but ones that held great promise because they clearly raised the performance bar substantially for tablet class computers. And I say that as someone who has always been a huge fan of the iPad. The Surface Pro 3 exceeded my expectations. It is not a perfect tablet, but Microsoft made very significant improvements with the Pro 3, addressing the weaknesses of the Pro 2 and refining an already great design. The screen has grown from 10 inches to 12 inches, but it is now a much thinner tablet. The spec’s blow away other tablets on the market, but this device is really made to go head to head with laptops and ultra books and the prices of the various Surface Pro 3 models are at laptop levels, with the base model (64 GB – i3 chip) going for $799.00 and the top of the line (512 GB – i7 chip) going for nearly $2,000.00. Additional accessories that many will want or need, such as the attachable keyboard, a mouse and a dock will add several hundred dollars to the cost, depending upon what you get. So, the Surface Pro 3 ain’t cheap, that’s for sure, but I think there are a significant number of consumers out there who are willing to pay a premium for a device they think has very quality. Surely Apple, among others, has proven that to be true for many years. Only time will tell if the Pro 3 will be a big sales success, but I think it has a decent shot of being a successful product and carving out a significant niche in the tablet/laptop market. What I really like about the Surface Pro 3 is that it is the first tablet computer that could realistically serve as the only computer that one would need and at only 1.76 pounds it is a device that can easily be taken everywhere. It is a true all-in-one device. Unfortunately, the Windows 8 operating system is still an OS that needs significant improvement in some areas and is not fully developed in some respects, especially as a mobile/tablet OS. However, Windows 8 is really the only OS that can allow a hybrid device to function as a full blown computer and a fully functional tablet, with an assortment of mobile device style app’s. I’ve played with the gen 1 and gen 2 at the Microsoft Store and my I don’t consider Win 8 a major drawback. In fact, I like it, but I recognize that is a long way behind iOS and Android in terms of the number of app’s developed for it at this stage. 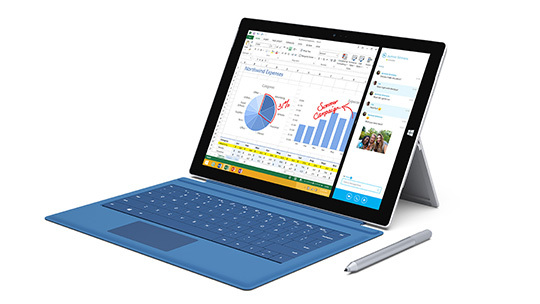 Apple should take notice of just how thoughtful and innovative the design of the Surface Pro 3 is. If Apple produced an iPad with Spec’s similar to those of the Surface Pro 3 and enabled it to dual boot OS X and iOS it would be a HUGE hit in my opinion. Microsoft has announced that the Pro 3 will hit select Microsoft Surface stores on June 6th, so that people can see it person and get some “hands on” time with it before it officially goes on sale on June 20th.. I will definitely be heading over to the Microsoft Store here in San Diego to see it. I will return to this post and add more impressions of the Pro 3 once I have seen it in person.